In the spring of 1971 I was still a grad student at Columbia University in NYC, living at 1419 John Jay Hall—in a 1917 building with vintage elevators only one of which worked at any one time. There were days that neither was in service and you packed carefully for the day, praying that seven or eight flights down you didn’t realize something left behind; in that case I usually continued down and bought a new one. Across the hall from my room were two interesting guys. One was totally blind and just as completely obnoxious. He had a pneumatic typewriter that embossed the paper with a braille pattern. That alone was a revelation; the annoying thing was his choice to rev that baby up at 3:00 a.m., the time of day being of little concern to him. Suffice to say, it made a hellacious racket. One day when the elevators were out of commission, I heard his cane tap-tapping up the stairs as I was on the way down. Whereupon I briefly entertained this thought: If I pushed that prick over the rail, no one would ever know. It was a good feeling. The other grad student across the hall was John Carrigan, an affable philosophy major who just happened to own a car, which, on Manhattan Island, was no small resource. John’s family owned a vacation house in Greenport, the end of the Long Island railroad on the island’s north prong and one weekend I was his guest for some much needed R&R. I mention this because it and one other vacation “cabin” are my only experience with that sort of lifestyle (a word I use with caution). So, when writing about Anson Tennant’s 1912 vacation at Mantoloking, I have to reach back to those three days. 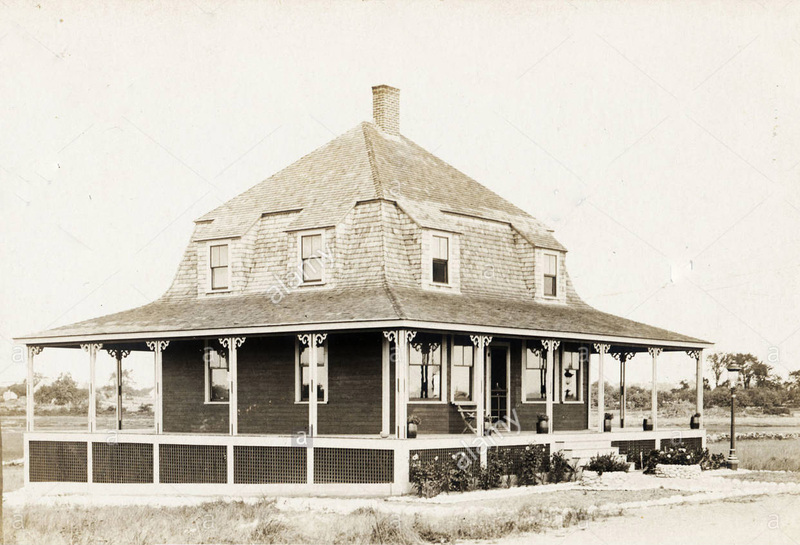 With a little photo-shopping, this borrowed image will do nicely for Hester Tennant Farnham’s beach house at Mantoloking, site of a 1912 summer visit by the Iowa branch of the family. The background is surely flat enough for the coastal sand bar that accommodates Mantoloking and string of other summer hamlets along the Jersey Shore, but I think it needs better entourage as well as some sand. For late-19th century “Shingle Style” picturesqueness, however, this is hard to beat. Still working on Mrs Farnham’s place in the Tennant family tree. By agincourtiowa in Uncategorized on Monday/23/July/2018 .